Unfortunately Plus Lotto is now closed. Play at Plus Lotto and you’ll be contributing to the work of the International Federation of Red Cross and Red Crescent Societies. 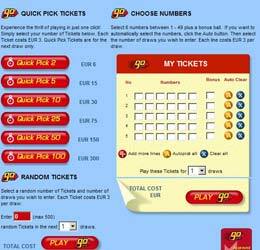 Offers several big-jackpot Lottery draws, alongside Instant Win games and Scratchcards. random draw taking place every minute. Pick!t Lotto gives you a chance at winning the progressive jackpot. Select your lucky number and if it is drawn in the next 5 consecutive games you win the jackpot. You also win prizes if your number is drawn 2, 3 or 4 times in the next 5 consecutive games. Weekly draw with Progressive jackpot. Each Ticket costs US$ 1. You can watch each and every ball being drawn live every Friday at 15:50 pm (CET). As well as the big Lotto draws, Plus Lotto have a wide variety of Scratchcards and instant win games such as Keno and HiLo. Customer Service via email, fax or Customer Care line (09:00 – 17:00 CET). PLUS Lotto claim to have been is the world’s first Internet lottery. Online since 1995, they’ve paid-out MILLIONS in prizes. PLUS Lotto has already saved thousands of lives through its contributions to the International Federation of Red Cross and Red Crescent Societies and other charities. By the last audit they had contributed US $ 2,300,000 to charities. Thawte certifies us and guarantees that personal information such as your credit card details is being protected and securely processed. A Lloyds of London broker insures weekly lottery jackpots. Liechtensteinische Landesbank AG holds Member’s funds. It is 60% owned by the Principality of Liechtenstein and has an AAA rating. The International Lottery in Liechtenstein Foundation, a charitable foundation that operates PLUS Lotto, is authorised and controlled by the government of Liechtenstein. Thöny Treuhand AG audits the PLUS Lotto books of account and scrutinizes all the pre-draw and weekly draw procedures. This includes weekly and hourly lotteries and the instant games. The site plays in US$, Euros or Swiss Francs. You can deposit and receive your winnings in any currency. Comments & Feedback on "Plus Lotto Review"